EXETER – All season the Monarchs have moved different players into positions on the field they may not be familiar with. Many of the moves are because of an injury. Last Friday night Exeter had to call on Kaytee Davidson to start at forward. She came through in a big way scoring the first goal in Exeter’s 3-0 win over South, and advances to the division four semifinals. In the final game of the season Lexe Cortez, Exeter’s leading goal scorer, went down with a right ankle injury. Lasky says her not playing was a game time decision. In order to prepare for Cortez being out the third-seeded Monarchs (13-5, 8-2) began moving players into the center middle position. Once Davidson made her appearance during practice it was clear she was the right fit. Halfway through the first half it showed to be a good decision. In the 17th minute Exeter was given a corner kick. Exeter’s Karina Mendez sent the shot into the penalty box. Davidson charged in and leaped at the last second before the ball passed her. She caught enough of it and redirected the shot in the far side of the net. Later on in the 30th minute Davidson returned the favor. She headed the ball into the South (12-8-4, 5-3) penalty box with two defenders closing in. The header caught the defenders off guard. To the left side Mendez took the ball past the defenders and scored in the lower right corner. In the second half Yvette Hernandez scored to make it the final score. Although, if it had not been for Bryce Maurer keeping the ball in on a South clearing attempt the goal might not have occurred. Before the game started Lasky knew that if his team had any chance of advancing they had to stop South’s Sabrina Weinman. 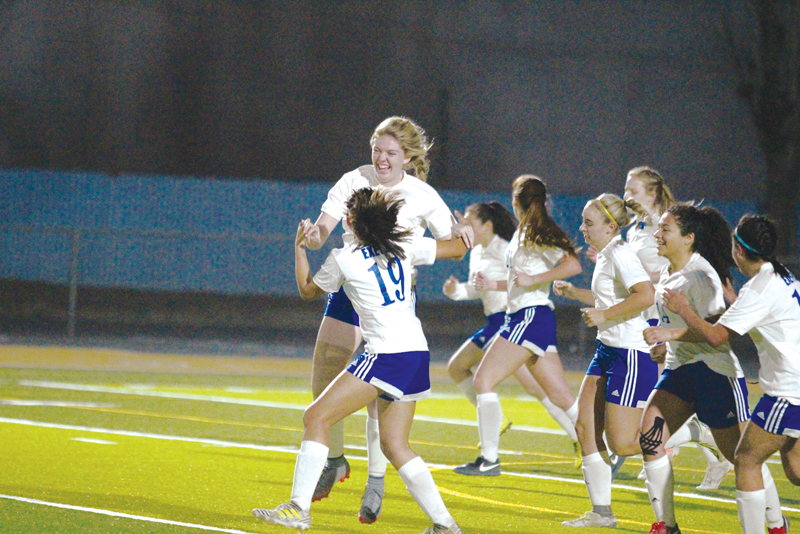 In the Rebels opening round 3-2 win over Wasco Weinman scored two, including the game winner. Instead of changing his defensive strategy Lasky instructed his defenders to not let Weinman cut up the field. With that in mind Weinman was neutralized. Only once during the first half was she able to attack along the near side of the field. She was fouled which resulted in a free kick for South deep inside Exeter’s zone. The kick skidded harmlessly through the penalty box. Up next for Exeter was a road trip last night to play the No. 2-seeded Foothill Trojans (16-4-2, 6-2). Final score of that game was reached after press time. With so many players out, and with Monarch players uncharacteristically cramping up during last Friday’s game, Lasky decided to give his team time off until game day. His plan is that his players will come back rested and healthy. “If they do not know what they are doing this late in the season, then we are in trouble,” Lasky said.